When constructing topographic maps of land, one can always measure the altitude of any point of the surface precisely. However, when constructing a bathymetric map, it is practically impossible to determine the exact depth of any point of the bottom of the sea. Obviously, bathymetric maps are more precise when more data of depth measurement per surface area unit in the given region are available. 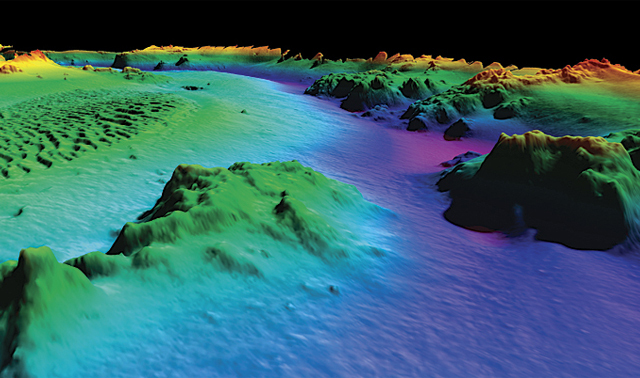 Currently, the most precise and detailed bathymetric maps result from using data from multibeam echosounding. The multibeam echosounder is a special kind of echosounder, which is located on board of the vessel and measures the depth simultaneously in several points of the bottom. These points are located on the straight line perpendicular to the vessel track. These points themselves are determined by the reflection of several acoustical pulses (beams) directed from one point at different angles to the vertical. The determination of depth in this method is performed regularly within periods of several seconds during the vessel motion. The measurement data are stored in a computer, and using them the map of an isobath of narrow bottom stripe can be represented periodically, or these data can be represented on a monitor.It should be noted that in addition to the multibeam echosounder, other devices that measure depths simultaneously in several points of the ocean bottom have been developed, but all of them are based on the reflection of sound signals from the bottom.